Every Stubby is made here in the US of A and is specifically designed for its particular application. They are machined out of 6061 billet aluminum and then powder coated with a black textured finish, so you know that a Stubby will never break, chip, or fade. Not only does the Stubby look great, it actually works great too. If you are curious about reception, our best advice is to read the reviews. You can see that some customers have definitely had problems getting good reception. I can assure you it is statistically uncommon though, and we always accept and pay for returns if you are not satisfied with your Stubby for any reason. 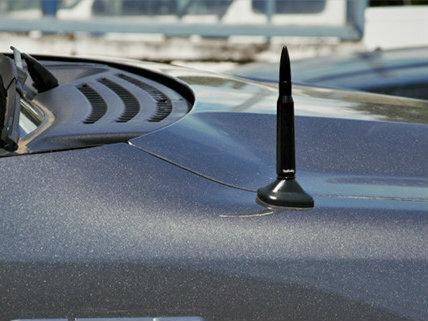 The Stubby antenna replacement comes in 3 styles, each one is tailor fit to it’s specific application. The Original Stubby ranges from about 3-4 inches, depending on the vehicle. The Stubby Jr’s are 2 inches tall to be sure to fit under your garage door. The Bullet Style Stubby is between 4.25 and 5.5 inches (.338 or .50 cal), again depending on the vehicle. They are also anodized, rather than powder coated. To see exactly what size your's will be, just select your model in the drop down menus above. If you want something all your own, we offer custom engraving for an additional fee. To order a custom engraving head over to the custom engraving page. We don't really care what you want to say on your Stubby; put your forum handle, license plate, dog's name or whatever; as long as it is 10 characters or less.